Baba Kadhera Singh College of Engineering and Technology is run and managed by Gram Vikash Kalyan Sansthan (GVKS), Akkha, a registered Non Government Organization of public nature. The Organization is registered under Govt. Society Act.1860. Eminent personalities across the country are members of College Management Society and GVKS. Campus: Baba Kadhera Singh College of Engineering and Technology is run and managed by Gram Vikash Kalyan Sansthan (GVKS), Akkha, a registered Non Government Organization of public nature. The Organization is registered under Govt. Society Act.1860. Eminent personalities across the country are members of College Management Society and GVKS. The main aim of GVKS is all round development in rural and remote area through charitable activities so that backward and remote areas could also join streamline and enjoy the benefits of modern scientific achievements. Establishment of this college is one concrete step in this Educational programme. 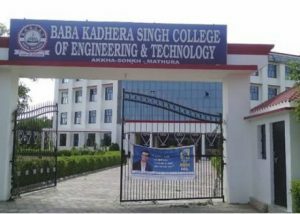 Baba Kadhera Singh College of Engineering and Technology is affiliated to U.P. Technical University, Lucknow and approved by AICTE. The college provides Bachelor of Technology course. Central library: Central library is available.